Millions of Americans will be giving thanks this month and many will be enjoying the time off work by playing slots. 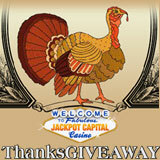 There are lots of Thanksgiving casino bonuses around but one of the best is the Thanksgiveaway casino bonus event at Jackpot Capital Casino. Just in time for American Thanksgiving there are nice match bonuses available and cash prizes, free spins and Amazon gift cards to be won. Claim a series of five deposit bonuses you can get up to $720 in match bonuses. Then, when you’ve used all five Thanksgiveaway coupons, there's a $25 no-deposit bonus. You'll find the coupon codes for the 6 casino bonuses here: http://promotions.jackpotcapital.eu/thanksgiveaway. They're available until November 31. Then there's the Thanksgiving Day Turkey Hunt Draw. If you play any of Jackpot Capital's Realtime Gaming games this month you'll be eligible to win cash prizes and Amazon gift cards up to $100. Also, if you've played at all in November then you'll get ten free spins on Hen House when you logon on Thanksgiving Day, November 26. All games in the mobile casino (m.jackpotcapital.eu in a mobile browser) for Apple and Android phones and tablets qualify.